Based on the 16th century romance of Katharina von Bora and Christian theologian and reformer Martin Luther, this novel plunges historical fiction fans into a turbulent time, where a strong man confronted the powerful Catholic church, and a courageous woman was called to love him. Katharina von Bora has seen nothing but the inside of cloister walls since she was five. Like thousands of other monks and nuns, her deepest desires for love and family are awakened by the teachings of Martin Luther, a heretic monk who defies the pope and princes to condemn cloistered life and promote the goodness of marriage. In a daring escape, Katharina finds refuge with Martin Luther and seeks his help to pair her with the noble, wealthy husband she desires. At a time in history when class tensions and religious conflicts are escalating toward the brink of war, Martin Luther believes that each day could be his last. He has no interest in practicing what he preaches and determines he will never take a wife. Katharina has no desire to marry beneath her status as a noblewoman. As the horrors of the bloody Peasant War break out around them, the proud Katharina and headstrong Martin Luther fight their own battle for true love, in one of the greatest love stories of history. :She was a nun of noble birth. He, a heretic, a reformer…an outlaw of the Holy Roman Empire. In the 16th century, nun Katharina von Bora's fate fell no further than the Abbey. Until she read the writings of Martin Luther. His sweeping Catholic church reformation-condemning a cloistered life and promoting the goodness of marriage-awakened her desire for everything she'd been forbidden. Including Martin Luther himself. Despite the fact that the attraction and tension between them is undeniable, Luther holds fast to his convictions and remains isolated, refusing to risk anyone's life but his own. And Katharina longs for love, but is strong-willed. She clings proudly to her class distinction, pining for nobility over the heart of a reformer. They couldn't be more different. But as the world comes tumbling down around them, and with Luther's threatened life a constant strain, these unlikely allies forge an unexpected bond of understanding, support and love. Jody Hedlund is a best-selling and award-winning author. Among a variety of writing genres, she especially loves bringing long-forgotten women of history to life. She makes her home in Midland, Michigan with her husband and five busy children. When she's not writing, you can usually find Jody sipping coffee, eating chocolate, and reading. 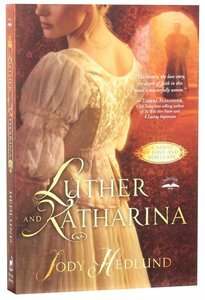 Customer Reviews For "Luther and Katharina"
A captivating story based on Martin Luther and his wife. Jody Hedlund did an outstanding job of telling the tale of Luther and Katharina without trivialising the work of Martin Luther. I highly recommend this book.